The Hawkesbury Region boasts beautiful world heritage locations, majestic rivers and more national parks than any other part of Sydney. It's hard to believe that such a diverse, unique wilderness is only a 2 hour drive from the centre of Australia's largest city. The Blue Mountains National Park is part of the Greater Blue Mountains World Heritage Area and covers an area of 247,000 hectares. 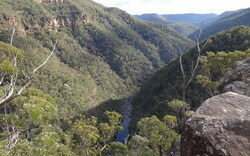 Blue Mountains National Park is a haven for canyoners and bushwalkers alike. There are many scenic lookouts and walking tracks and this park is one of the major nature-based tourist destinations within Australia. Blue Mountains National Park with its untouched wilderness, its sheer sandstone cliffs, valleys, gorges, rivers and waterfalls is located only one hour from Sydney. Access to the park is well signposted from Cattai Road, Maraylya. On the eastern side of the road, turn into Mitchell Park Road for the Field Studies Centre. 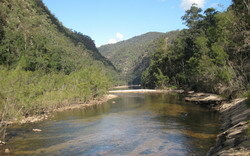 Cattai National Park is located 15km from Windsor alongside the Hawkesbury River. 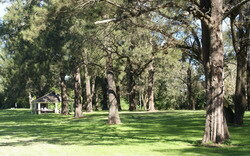 The park contains pockets of small wetlands areas, tall forests and gallery rainforest. Part of the park was an original first fleet grant and contains important historic and archaeological resources. Access to Dharug National Park is via Wisemans Ferry Road and Settlers Road at Wisemans Ferry. 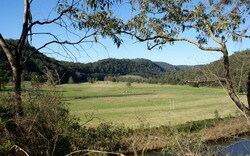 Dharug National Park is located on the north of the Hawkesbury River opposite Wisemans Ferry, adjacent to Yengo National Park. Dharug National Park contains a substantial section of the historic Old Great North Road Convict Trail, the original convict road connecting Sydney and Newcastle. The Old Great North Road has easy access and is fun to explore. Access is from Pitt Town Road (off Windsor Road), turn into Saunders Road and follow the signs to Scheyville National Park. Alternatively from Boundary Road, turn into Old Pitt Town Road and follow sign to Scheyville Road. The park can also be accessed from Whitmore Road, Marayla. Scheyville National Park is located 5km east of Windsor and is 954 hectares in size. The park protects a large remaining portion of the Cumberland Plain woodland, which is an ecosystem threatened by urban expansion. 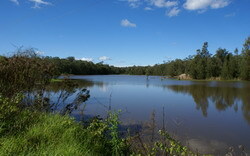 Longneck Lagoon lies within the park and is a significant wetland area. Access to this National Park from the Hawkesbury area is via the northern side of Bells Line of Road west of Richmond, also off Comleroy Road, Kurrajong, as well as on the western side of Putty Road (Singleton Road) north of Windsor. World Heritage listed Wollemi National Park is the second largest conservation reserve in NSW and covers an area over 487,500 hectares (200,000 hectares of this is the largest remaining wilderness area in NSW). 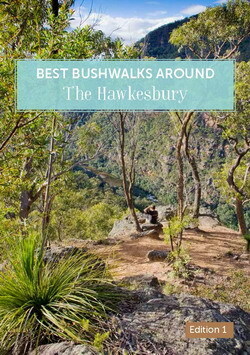 The Hawkesbury has the privilege of being part of this World Heritage area. As well as being home to the famous Wollemi Pine this park is a natural wonderland offering spectacular scenery and a diversity of plant and animal life. The Colo River Valley, which is one of the largest sandstone canyons systems in Australia, runs through the park. Access to Yengo National Park is via Windsor on the Putty Road (Singleton Road), via Wisemans Ferry on St. Albans Road, and Settlers Road, via St. Albans on Wollombi Road and Mogo Creek Road, and south of Wollombi on George Downes Drive. Yengo National Park stretches for over 70 kilometres from Wisemans Ferry to the Hunter Valley. Yengo consists of a wild area of steep gorges and rocky ridges, and forms an integral, natural link from east to west, between the coastal region and the Hawkesbury Valley. Yengo National Park is a World Heritage-listed wilderness, and boasts the famous Old Great North Road walks and Aboriginal cultural heritage sites such as Mount Yengo.